Take your lashes to a whole new level with this revolutionary vibrating mascara that delivers 7,000 oscillations per minute to re-create the application technique of a makeup artist. This lash-transforming powerhouse does it all: lengthens, separates and multiplies with just the press of a button. In an instant, you’ll experience a breakthrough sensation in application as the vibrating brush, combined with an exquisitely smooth formula, wraps every lash up to 360°. You’re lashes will be utterly transformed before your eyes. I remember there was a lot of buzz (see what I did there?) around this mascara when it was first released. There was so much hype about the technology that was involved. I still don’t quite understand it but the mascara vibrates hence the name Oscillation. One of my brothers was interning somewhere in ‘Murica at the time (2010? ), when this came out and I remember begging him to buy this for me (along with Urban Decay’s Naked Palette, and Philosphy’s Unconditional Love Eau de Toilette) which he did (thanks bro!). Lancome’s Oscillation Mascara was available for purchase in Kuwait shortly after and I’ve been repurchasing it ever since. The packaging on this thing is quite sleek. The cap has a reflective mirror-like top, Lancome’s signature single golden rose, and a button which you have to hold down for the mascara wand to actually vibrate. When you first buy the mascara, you have to remove the plastic flap (that you can see sticking out in the photos) otherwise the mascara won’t vibrate. Some watches come with the same plastic flap which you have to remove, for the watch to work. I’m not sure but I think it has something to do with the battery life. The plastic bristles on the wand are spaced out in a way that makes them perfect for applying mascara to nonexistent lashes like mine. It coats them in a way that really darkens and defines them. It’s also slim enough for you to really get in there and perfectly coat even the inner corner lashes. Although the bristles are plastic, they are neither scratchy nor painful. 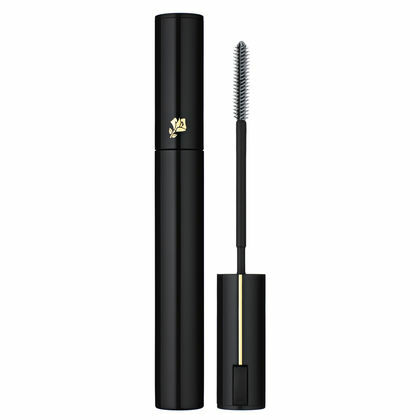 The formula itself is fantastic and dries down to a deep matte black which is why I sometimes use this as a topper over other mascaras. It just really intensifies the lashes. It does have that cloying grandma perfume scent to it which is only apparent when you first open up the tube to apply the mascara but dissipates shortly after. Lancome’s Oscillation is more of a “wet” mascara, which is what I prefer, and plays nicely with other mascaras. I don’t care for the vibrating option, which got old real quick, and after accidentally pressing the button (that makes the mascara vibrate) one too many times, I just decided to keep the plastic tab in, as this makes me jump every time it vibrates unexpectedly, which ruins my makeup. I really love trying out different mascaras but this is a long time favorite. I always have to have a tube laying around at all times. I enjoy using this on it’s own and I enjoy using this as a topper, as I’ve said before so I highly recommend you give this a try. It might become one of your faves as well. Love it!